The key to protecting privacy lies with transparency and public oversight. In truth, they are both, and they are no longer futuristic concepts. Since the growth of “surveillance cities” is no longer a hypothetical, we should all be ready to do what it takes to create responsible safeguards, and prevent the unnecessary risks and harms this technology can create. Both elected officials and the public should be provided notice of the potential deployment of these technologies, the potential privacy and civil liberties risks they present, and the real impact of their use. Whereas these surveillance technologies are often used in secret after they are acquired, only a law that mandates transparency can produce such outcomes. Moreover, cities should prioritize openness and transparency about a project before the project is implemented to limit any potential adverse effects. The Sunlight Foundation advocates for technology and data to enable government transparency and accountability through the development of mechanisms for collecting public feedback in policy and decision-making. The American Civil Liberties Union also supports robust oversight of the government, especially when it comes to surveillance and law enforcement’s use of new technology. The ACLU is particularly sensitive to the fact that these powerful surveillance tools disproportionately threaten the rights of communities of color and vulnerable groups like immigrants and Muslims. 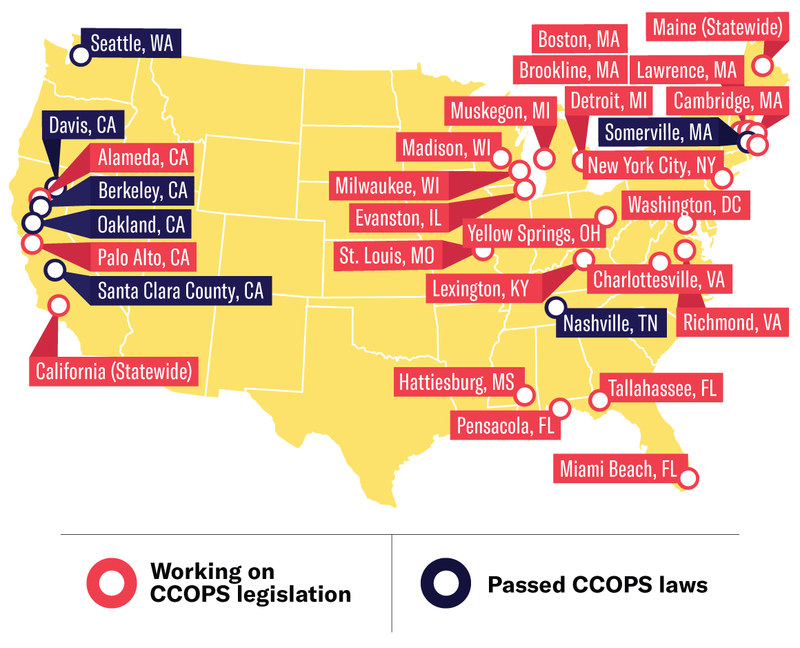 The CCOPS effort provides a set of guiding principles, authored by a highly diverse group of 17 advocacy organizations, as well as template model bill language for surveillance ordinances that explicitly requires transparency and public input in the procurement and deployment of surveillance technology. The model bill’s provisions include a transparent approval process that requires public disclosure, open hearings, and sign-off from elected officials on all surveillance technologies and the specific ways in which they intend to use them. Also required is a publicly released surveillance impact report that includes potential adverse effects on civil liberties and civil rights, as well as mechanisms for minimizing those risks. In addition, the model requires the submission and council approval of a legally enforceable use policy that thoroughly outlines how the technology and surveillance data can and cannot be used. The use policy must provide standards to govern and limit the technology’s deployment and how collected data is analyzed, stored, protected, and shared. Ongoing oversight and accountability are provided by a public annual report with non-sensitive data about how the technology has been used, information about violations of the use policy, and an analysis of any negative impacts on people’s rights. The model bill also prohibits non-disclosure agreements between cities and technology companies to favor the public’s right to access information over corporate interests. Regardless of how dazzling a technology is, city officials would do well to remember their obligations to their constituents when considering the creation of a Smart/Surveillance City.